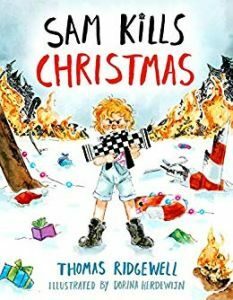 You are here: Home » MEDIA » Books » Sam Kills Christmas by Thomas Ridgewell, Dorina Herdewijn and Eddie Bowley (book review). ‘Sam Kills Christmas’ is a strange book and, while marketed as a children’s book, it’s not one to be handed out to youngsters without a degree of forethought. While this reviewer’s four year-old certainly listened with due attention and appreciated the twist at the end, she found a lot of it a bit too dark for her tastes. It’s a satire, of course, on the idea that Santa gets to judge who’s been naughty and who’s been nice. In this case, Sam (whose gender is left unstated) has decided that Santa is undeserving of such an honour. It’s apparent from one of the illustrations that Sam is an orphan and the reason for that is not unconnected with Santa’s yuletide activities. So, while Sam appears to be psychopathic little horror to start with, once events reach their climax, his anger becomes a lot more understandable. The story finishes with rough justice being meted out and Sam taking over the festive role, but this time without the judgemental attitudes or slapdash working practices of the previous incumbent. Such should ensure a happier Christmas for children the world over, all thanks to Sam’s bravery and fighting abilities. So if this doesn’t sound like a classic Christmas story for the little ones, you’d be absolutely right to think so. It’s a satire and quite a gory one at that, though it’s all handled with just the right degree of restraint, so the violence is more Tom & Jerry than Quentin Tarantino. Indeed, the artwork by Dorina Herdewijn is brilliant and does a lot to soften the edges to what is otherwise quite a brutal tale. Overall, there’s a modernity to this book that sets it apart from the usual Christmas books that tend to favour historical or even fantastical settings instead. With its copious puns, use of the Internet and even the apparently pasted-on minced oaths, this is very much a contemporary Christmas tale. If not actually heart-warming, it’s affirming at least of the anger some children feel and their justifiable need to put the past right. A good book then, but best read by parents before sharing with little children. « 20th Annual Animation Show Of Shows (a film review by Mark R. Leeper).